Yesterday marked exactly ten months since Bo Xilai’s spectacular fall from grace on the Ides of March last year. His eventual fate is still unclear, though last week the Xinhua News Agency issued a terse announcement that Bo, the former Party Secretary of Chongqing, had been “handed over to judicial authorities,” meaning that he’s headed for trial. Whether that trial is next month or next year, however, is known only to the Chinese leadership. The secretive nature of Bo’s trial date is appropriate, since many of the events that led him to this point are similarly cloudy to those of us on the outside trying to peer into the opaque world of elite Chinese politics. It’s anyone’s guess whether or not we’ll ever learn the full story behind Bo’s downfall, though my bet is that we won’t—or at least not for a long, long time. After all, it’s been forty-one years since Lin Biao’s plane fell from the sky as he tried to flee Mao’s reach, and we still don’t know much of anything about that incident. When the Chinese Communist Party really wants to keep something under wraps, it does. Garnaut is a reporter for The Age and Sydney Morning Herald who has been writing on China’s “princelings” (taizi dang), the sons of legendary CCP founding figures, for years. House of Bo benefits immensely from his understanding of leading CCP families and the impact of personal relationships on elite politics. In his telling, the roots of Bo’s downfall can be traced to feuds and alliances stretching all the way back to the 1940s. Bo Xilai’s father, Bo Yibo, and Xi Zhongxun, the father of incoming Chinese president Xi Jinping, wound up on opposing sides during the Gao Gang Affair (the first major political split in the PRC) and the 1987 purge of Hu Yaobang. Their sons have circled each other warily throughout their careers. Though Xi once expressed support for Bo’s anti-corruption campaign in Chongqing, all traces of his favorable words have since been scrubbed from the Chinese Internet. But politics makes strange bedfellows: the two share a political patron in former CCP General Secretary Jiang Zemin. Garnaut does an admirable job of analyzing what propelled Bo through his career, and the factors that contributed to his downfall. In many ways, it’s a not-uncommon tale of a power-hungry politician whose greatest mistake was believing himself invincible. But Garnaut also suggests that Bo was motivated, at least in part, by ideology and a genuine desire to restore the “red legacy” bequeathed by his father’s generation. Believing that the PRC’s founders had built something bigger and better than what China has become since the Reform Era began, Bo decided that it was his duty to lead a return to the core principles of the New China. And in a China where there’s a pervasive popular sense that something is broken, it’s easy to understand why people would flock to support a charismatic leader who had a clear vision of how to fix it. That’s why Bo Xilai might be down, but it’s not a foregone conclusion that he’s entirely out. I’ve heard anecdotal evidence that people in Chongqing still appreciate his efforts to clean up the city (never mind the fact that Bo was just as corrupt as the mobsters he imprisoned). His family, like many other princeling clans, has a history of political resurrection; Bo Yibo spent the Cultural Revolution in political exile, but returned to the inner circle during the Deng era. If things were to go south for the CCP and a back-to-the-basics ideological approach seemed the best way to fix the situation, it’s possible that Bo Xilai could be rehabilitated and his story could have a second act. But that’s kind of a long shot. 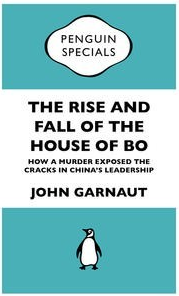 In my view, there’s another reason why it’s premature to talk about “the fall of the house of Bo”: Bo Guagua, the twenty-five-year-old son of Bo Xilai and Gu Kailai. He played a central role in his mother’s downfall, as it was allegedly after he was threatened with blackmail by Heywood that Gu murdered Heywood to protect her son. While Bo Guagua is currently in the United States, there’s no reason to assume that his father’s one-time allies wouldn’t seek to bring him home if they should need the Bo name and the decades of history behind it at some point in the future. It’s also more than likely that Bo Guagua will ascend in his own right: a graduate of Oxford and Harvard, he’s the cosmopolitan, well-educated scion of an elite family, and that’s a powerful combination in any context, regardless of his parents’ political status. As Garnaut notes, Bo Guagua has been subject to “his family’s suffocating love and towering expectations” his entire life. With his parents’ legal troubles, as he expressed in an email to a friend, “I now have the chance to live my own life and make my own choices.” It’s difficult to imagine, though, that he would simply walk away from the dynasty his legendary grandfather founded and not try, somehow, to rebuild the House of Bo.